So, like almost everything I make, this recipe began as me wanting to make a recipe from a fantastic recipe I’ve been wanting to try, but then realizing I didn’t have the right ingredients. Happily, this pancake was born instead, and unlike some of my other inventions, it is definitely worth jotting down for future breakfasts. My cute little Peter said to me, (after I announced that I had, you know, made up the recipe), “you mean, we’re the only people in the whole world eating these pancakes. And I said, “well, yes, I guess you are.” And that was kind-of fun. For my family of seven, I doubled this recipe. Preheat your griddle to about 375 degrees. In a small bowl, combine the egg, cottage cheese, and milk (also with a whisk). Pour the wet ingredients onto the dry, and mix lightly with a wooden spoon until no dry patches remain. Then, lightly fold the raspberries in. Or be rough, so that the raspberries are throughout the pancakes. Dollop onto a heated griddle and proceed as you know. 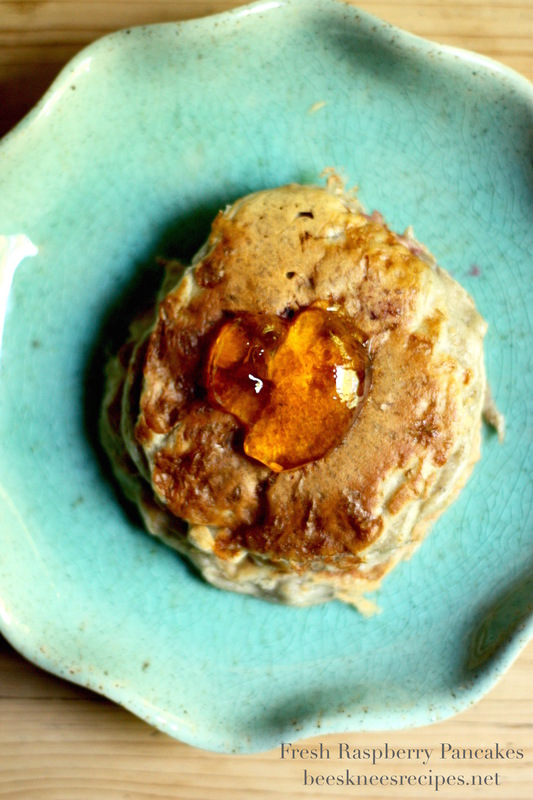 These pancakes taste great with lots of toppings, but we especially like maple syrup or apple jelly.